= Ariocarpus fissuratus var. lloydii f. cristata hort. Origin and Habitat: Ariocarpus fissuratus var. lloydii grows in central Mexico and ranges from southern Coahuila and adjacent Zacatecas to eastern Durango (Nazas, Peñon Blanco). Crested form: The crested Star Rock (Ariocarpus fissuratus var. 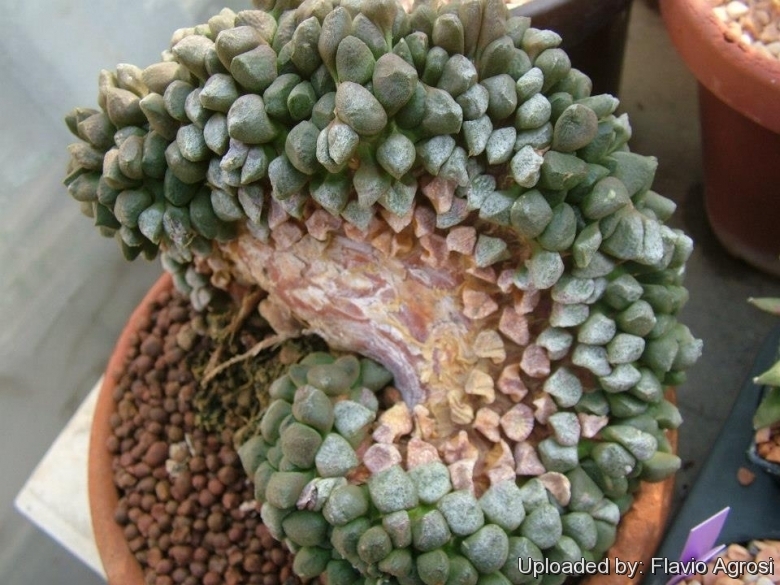 lloydii f. cristata) is a very rare, slow-growing and highly priced crested cactus forming odd sculptural shapes. Its stems fan out and can get very big making a spectacular specimen. The crested form - despite to its beauty - is still very rare, pricey and sought after by collectors. Stem: Grey, or olive-green, fan shaped slowly forming brain-shaped cushion that can reach a considerable size (up to 3-12 cm high and 70 cm in diameter, or more).